In some ways, watching the developing iPhone market is like reliving the similar rise of console or computer games from the ’90s. Every developer is scrambling to produce the best graphics, the best gameplay, and doing so at a much faster rate than their console and computer predecessors. Eyes on the Road: Real Racing sports an in-the-cockpit view and an outside view. But Firemint’s Real Racing isn’t just another step forward graphically; the game has received recognition and awards because of its social potential. Similarly, the reason why the iPhone has been an exciting-to-watch horse race is because its connectivity abilities far surpass anything else we’ve seen. Real Racing begins to deliver on the potential of the iPhone as a social gaming device. While not firing on all of its cylinders yet, Real Racing is still the prettiest and fastest car we’ve seen so far. Though it sounds blasé to say it, the prettiest girl at the ball gets the most dances. Real Racing is real pretty, and man, can she move. Real Racing has some of the most beautiful and cleanest graphics we’ve seen for the iPhone. The cars are rendered with believable detail and the environments, though similar, are fairly realistic. Not only visually stunning, Real Racing is also a great deal of fun to play. The controls are challenging but more advanced then you’d expect. You steer your car with one of four configurations, the main two either require you to tap the screen to steer your car or tilt your iPhone in the direction you want to go. Using the motion sensor controls of the iPhone, the latter configuration scheme effectively turns your iPhone into a steering wheel. While this makes playing Real Racing on the bus a surefire way to get awkward stares, its perhaps the cleverest and most fun use of the iPhone’s motion sensor controls yet. In the standard cockpit view, you’ll be able to see the number of laps you have left, and what position your car is currently in; a click on the rearview mirror brings up a rearview camera perspective as well. You can also switch the camera to a third-person view (rather than the standard cockpit) to have a more complete world-view of the race. As you play, you’ll get to understand the subtleties of the game as well. You can set how much of the brakes are automated during turns, and how much you want to manually control the brakes. By letting the computer engage your brakes, you’ll effectively be able to perform the same turns your competition’s cars can make. But by taking over some control of the brakes, you’ll be able to make faster (and more dangerous) turns that can give you a distinct advantage over your opponents. Real Racing offers Quick Race, Time Trial, Career, and Connected Modes but you’ll likely spend the majority of your time playing with the latter two modes. The Career Mode allows you to race in different leagues and unlock cars, difficulty settings, tracks, and races. You’ll have to complete time trials in order to qualify for certain tours and then compete a series of courses against computer opponents to earn victory in that particular tour. You’ll eventually unlock three classes of cars and many different varieties per class. The Connected mode allows the player to engage Real Racing’s spiffy new multiplayer functions. You can either join or create a local (LAN) game or use your Cloudcell account to link up with opponents globally. (More on this in a moment.) Then you can see available leagues and the time window left to join them. You can see stats of opposing players and post your own times by completing races. Though still in its infancy stages, the multiplayer functions are a welcome addition to an already stellar game. Cloudcell is a social networking service used by Firemint for its games, including Real Racing, the air traffic controller game Flight Control ( ), and Fast & Furious The Game, a street racing action game based on the Vin Diesel movie. It only takes a few seconds to set up an account via Cloudcell and sync your iPhone, and it’s free to use. Real Racing gets a lot of things right. Many competing racing games spend oodles of money securing big-name bands for the soundtrack (rather than concentrating on the player’s experience) and offer stunning graphics but with stiff controls. Though Real Racing is challenging and its controls take getting used to, the design is more realistic to actual racing conditions and more rewarding for dedicated players. The alt-rock soundtrack is also pretty catchy and though thin in its variety, it’s plenty serviceable for the high-octane action of the game. Real Racing is expensive. 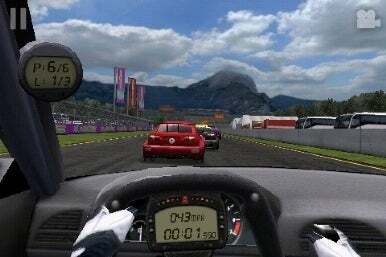 While $10 is a bargain for a console game, or a DS or PSP game, the price puts Real Racing at the very top tier of entertainment software for the iPhone and iPod touch. Real Racing is a remarkable game, to be sure, but that price will put it beyond the reach of many gamers who just aren’t willing to spend that much on a game from the App Store. If a sequel is in the works, then Firemint still has plenty of things to improve on. Offering more than six cars per race and wider courses can add some more variety to gameplay, and I’d like to see damage impact both performance and the exteriors of cars. Right now the cars are all pretty much indestructible and don’t seem worse for the wear after grinding up against a wall. That said, Real Racing delivers great graphics, a fun racing experience, and easy-to-setup multiplayer functions. It hasn’t raced to the promised land of 3.0’s potential connectivity, but its way ahead of anything else I’ve seen. Real Racing is compatible with any iPhone or iPod touch running the iPhone 2.2 software update.